The Spyderco Para-Military2 has several changes over the classic version. The G-10 handle is narrowed at the end improving the ergonomics. The handle and blade have been profiled thinner; removing uncomfortable angles when in the closed position. It features a compression lock and an ambidextrous-friendly four way clip which carries tip-up/tip-down, left/right-hand and rests deeper in a pocket. 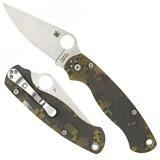 Spyderco kept the same high-performance CPM S30V full flat-ground blade but also lengthened the blade's tip and added additional surface jimping to both the spine and finger choil. Implementation of a Bushing Pivot System generates fluid action and more consistent manufacturing tolerances. Larger lanyard gives more options for carry.